“In the end, I think it would be lovely if we stopped this whole notion of pets altogether,” she has said. Ridiculously, PETA has argued that outdoor cats should be summarily killed instead of allowed to live. In a 2014 interview with the Washington Post, Newkirk argued that outdoor cats would be better off dead because they might contract a future illness or be hit by a car in the future. In PETA’s twisted mind, it’s more humane to just euthanize the animals than for a hypothetical harm to befall them in the future. Similarly, PETA has also argued in court that elephants are better off being killed than living in American zoos where they are well cared for. PETA’s pro-killing attitude is part of its core—and it should shock any animal lover. The Virginia Department of Agriculture and Consumer Services (VDACS) requires all animal shelters to report the number of cats and dogs they take in each year. The records indicate how many cats and dogs were reclaimed by their owners, adopted out, transferred to other Virginia releasing agencies (i.e. animal shelters and animal control), transferred to out-of-state releasing agencies, died of natural causes, euthanized (killed), and how many the shelter held alive at the end of the calendar year. We added the dogs and cats euthanized and divided by the total number of dogs and cats taken in excluding those held only for sterilization surgery to determine the percentage of dogs and cats PETA killed in a given year. In 2009, Virginia modified its policy and eliminated animals held for sterilization from the records. We obtained the reports by filing public records requests under Virginia’s sunshine laws with the Department of Agriculture and Consumer Services. The information for years 2004-2010 is also available on the VDACS website for public inspection (animals classified as “other” from 2004-2009 include those reported by PETA as held for sterilization). Recent documents uncovered by PETAKillsAnimals.com indicate that the Commonwealth of Virginia was so shocked by the number of animals PETA kills each year that the state inspector attempted to revoke PETA’s license to operate a shelter. This is probably because most animals taken in by PETA aren’t housed for very long. After reviewing two months worth of records, Kovich found that 245 of the 290 animals–84 percent–that PETA took into custody were killed within 24 hours. Only 17 were reported as adopted or in foster homes. Kovich noted that PETA’s shelter did not meet PETA’s own published guidelines for operating a humane animal shelter. At the time of the visit, Kovich found a mere three animals were in PETA’s “shelter” which apparently consists of three rooms on PETA’s 4th floor, nestled amongst cubicles and conference rooms. None of the animals available for adoption, and PETA’s representative indicated the shelter was not accessible to the public. Kovich reviewed the disposition of cats and dogs that were either euthanized or adopted/transferred out in the previous six years and found the adoption/transfer rate at PETA’s shelter dropped from an embarrassing 14 percent in 2004 to an abysmal 0.7 percent in 2009. In other words, of the 2317 dogs and cats in PETA’s shelter 99.3 percent were killed. PETA’s lawyer responded to VDACS arguing that a legal technicality protected their status as an animal shelter. Is PETA euthanizing perfectly adoptable dogs and cats? Since PETAKillsAnimals.com debuted in 2005, people have frequently asked PETA why it kills so many animals. PETA dubiously claims it does not run a “traditional animal shelter” and that it puts down animals that are too sick or injured to carry on. There are good reasons to believe this claim is inaccurate. In November 2014, WAVY-TV reported that PETA employees had allegedly taken a family’s Chihuahua without cause in broad daylight from the family’s home. A surveillance video showed a van branded with the PETA logo pull up in the driveway followed by a worker seizing the dog and driving off. Wilbur Cerate, the dog’s owner, said that PETA employees later returned to his home with a fruit basket and news that the dog had been killed. The Accomack County Sheriff charged the employees with larceny. PETA refused comment to WAVY despite numerous requests. In 2007, two PETA employees were tried for animal cruelty and littering in North Carolina after they were caught in a late night stakeout dumping the bodies of dead dogs and cats in a dumpster. Evidence presented during the trial showed that PETA employees killed animals they considered “adorable” and “perfect.” Likewise, witnesses at the trial testified that PETA told them they “shouldn’t have a problem at all finding homes” for dogs left in their care. Other North Carolina shelter personnel testified that they were under the impression PETA would find homes for the animals they handed over to PETA. These impressions were incorrect. PETA picked up dogs and cats from animal shelters in North Carolina and killed them before they even left the state. Beyond the evidence presented at the trial, PETA has never backed up its claim with any evidence to suggest that it only takes in injured or otherwise unadoptable dogs and cats. See images of the dogs PETA put down without giving them a chance at life. In 2014, PETA was contracted to help remove stray dogs in Eastern Virginia. But local resident Wilber Zarate alleges in a $9.7 million lawsuit filed in Norfolk that PETA officials paid children to lure his family dog off of his porch. When the kids failed to entice Maya, a Chihuahua, PETA officials trespassed onto Mr. Zarate’s porch and nabbed the pooch. When Mr. Zarate’s niece contacted PETA about Maya’s disappearance the next day, PETA denied even being in the area that day. When she told the representative at PETA that she had security footage of the dognapping the representative abruptly hung up. Two days later, the PETA employees who had abducted Maya returned with a fruit basket and the news that Maya was dead. Further violating the law, PETA euthanized Maya within hours of abduction instead of waiting the legally required five days. The Commonwealth of Virginia fined PETA for this infraction. Mr. Zarate’s daughter, who he bought Maya for as a Christmas present years before, began mourning immediately. “[Cynthia] cried for weeks, became lethargic, lost sleep, refrained from eating and lost weight,” according to the lawsuit. The lawsuit is pending and is set for trial in 2017. In 2003, in more than 15 states, the group handed out a graphic comic titled “Your Mommy Kills Animals” to children accompanying women wearing fur outside holiday performances of The Nutcracker and other theatrical shows. PETA gave grants to arsonist Rodney Coronado and the eco-terrorist group Earth Liberation Front. In 2002, PETA president Ingrid Newkirk told The Boston Herald: “More power to SHAC [the violent Stop Huntingdon Animal Cruelty] if they can get someone’s attention.” Six of SHAC’s core members were subsequently convicted for their attacks on businesses, with four serving between three and six years in jail. The PETA Foundation was formerly run by Neal Barnard, president of the misnamed Physicians Committee for Responsible Medicine. PCRM has been linked with FBI-designated terrorist groups, including SHAC and the Animal Liberation Front (ALF). In 2001, Barnard co-signed a series of threatening letters with the U.S. president of SHAC, who was convicted on federal terrorism charges in 2006. Dr. Jerry Vlasak, the ALF “Press Officer” who is known for openly advocating the use of violence to further animal liberation goals, was a PCRM spokesperson when he first called for the “political assassination” of medical research scientists in 2003. PETA also gave $2,000 to David Wilson, then a national Animal Liberation Front spokesperson. PETA paid $27,000 for the legal defense of Roger Troen, who was arrested for taking part in an October 1986 burglary and arson at the University of Oregon. 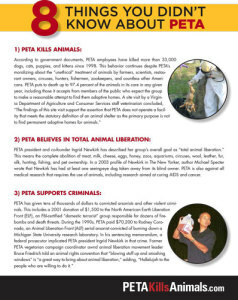 Click to download our new infographic that showcases some of PETA’s despicable actions and tactic that you may not have known! Ingrid Newkirk isn’t just the President of PETA, she’s also a militant activist. She’s soaked herself in fake blood, of course, but she’s also been arrested more than 20 times. And she’s an avowed supporter of the terrorist Animal Liberation Front. Newkirk wrote a book called Free the Animals! The Untold Story of the U.S. Animal Liberation Front and Its Founder, ‘Valerie.’ In it she writes that she has “become somewhat used to jumping on a plane with copies of freshly purloined documents and hurriedly calling news conferences to discuss the ALF’s findings.” In 1993, Newkirk arranged an interview for TIME magazine with “Valerie.” Later, the animal-rights movement would be abuzz with speculations that Valerie was just one of Newkirk’s PETA employees. The entire episode has suggested what many federal law enforcement officers have openly speculated: that ALF and PETA may be populated with identical personnel, the only difference being a setting sun and a ski mask. Newkirk gives interviews to ALF’s publications, supports the legal defense efforts of ALF criminals (with PETA’s money), has been subpoenaed in regard to her ALF connections, and has even been accused in court documents of participation in the ALF arson of a Michigan State University research lab. The head of the anti-animal testing animal rights group the Physicians Committee for Responsible Medicine (PCRM) was formerly president of The PETA Foundation. PETA awarded a grant of over $70,000 to Rodney Coronado, who was then accused and later convicted of arson against a Michigan research facility. “Ethical Treatment” is Optional for PETA’s Celebrities. These celebrities are PETA activists, but have shown flexibility with the organization’s forceful call for strict vegetarianism, also known as veganism. Jenna Jameson was photographed fishing, slurping oysters, and wearing a leather jacket just weeks after launching an anti-leather campaign for PETA. Morrissey got an official okay from PETA after eating at a steakhouse. Dita von Teese has written about her love of furs and foie gras. Steve-O built a career on abusing small animals on film. The officially “anti-fur” Eva Mendes has worn fur anyway. PETA insists, contrary to centuries of rabbinical teaching, that the Jewish ritual of kosher slaughter shouldn’t be allowed. Its infamous “Holocaust on Your Plate” campaign compared the Jewish victims of Nazi genocide to farm animals. Want to see more? We issued a report in 2005 that comprehensively debunked PETA’s religious campaign literature. Sign up to receive updates on PETA’s actions and learn what you can do to end them.